I am extremely honored and excited to announce that I joined Techstars as the managing director of the METRO Accelerator for Hospitality powered by Techstars in Berlin. Together with Franziska Lohl (Program Manager) and the METRO accelerator team we will recruit and accelerate 10 outstanding entrepreneurial teams who are ready to help shaping the hospitality industry. In the past 10 years, I have started four companies, acted as its CEO, CFO and COO, raising multiple venture capital rounds, worked with dozens of technology businesses as an M&A banker, advising companies on raising millions of dollars and selling businesses across the globe, being a business angel, mentor and advisor to startups and several accelerators. But compared to a serial entrepreneur journey, joining Techstars just feels by far as the most exciting move! Techstars is THE worldwide network that helps entrepreneurs succeed – for me that means working with the brightest minds and helping them build the next world market leaders, I can’t imagine anything more exciting!! I have seen a lot of changes across many industries and the increasing influence of technologies. Before starting my own entrepreneurial journey, I was always very fortunate to work with and learn from successful and super talented entrepreneurs during my career. Having the experience of working with early stage companies and more matured ones, I was always very curious about the persons behind the businesses – the entrepreneurs. METRO, with €30bn revenues and the global network, an amazing mentor pool and access to key industry players, is the perfect hotbed/frontier for hospitality startups to test, improve, fine-tune its solutions and find out what technologies customers need to succeed. Running two accelerator programs together with Techstars in parallel, for 4 years in a row, having invested in 50 companies together with METRO, offers the ideal conditions to turn your ideas into globally relevant products and sustainably successful companies. Applications for the METRO Accelerator for Hospitality powered by Techstars in Berlin are open now and close August 3rd, 2018. I’m excited to announce that we have opened applications for our second class of the METRO Accelerator for Retail, Powered by Techstars in Berlin! The METRO Accelerator for Retail, Powered by Techstars handpicks the best startups for an intensive three-month program in Berlin, built on the foundation of marked funding and coaching, together with access to investment opportunities. Within the program, startups gain close purpose-driven mentorship from industry leaders, innovators and entrepreneurs from different verticals of Retail, Tech and Wholesale trade. The METRO Accelerator for Retail, Powered by Techstars is strategically integrated with unparalleled access to the intellectual capital of METRO, the leading international specialist in wholesale and food retail, alongside FMCG companies such as P&G, serving consumers around the world with one of the strongest portfolios of trusted, quality, leadership brands. From customer service to collaborative and distributed value added commerce, multi-channel retail is where the action is. We’re seeking out entrepreneurs looking to usher in new era of retail disruption, and startups solving big problems along the entire value chain. If your business can disrupt or innovate the retail space across any part of the value chain, and you’re looking for access to coaching and mentoring from investors, highly-regarded executives and leaders from the largest companies in Europe, then apply to the METRO Accelerator for Retail, Powered by Techstars before the final deadline on Feb 2nd, 2018. If you apply before Jan 2nd, 2018, we will be able to help give you feedback on your application. To learn more about the upcoming program, attend one of our information sessions or visit our website. My response is typically that I don’t operate a startup zoo and if they want to feed the founders, they have to go elsewhere. This tends to make corporates a little bit annoyed. They ask me why I say that. My response is that an early stage startup is constantly fighting against death, and they literally have no time for this. What they need are people who can help them make money – everything else is a waste of time. Pilot activity that focuses on distribution or lead generation. Pilot activity that focuses on the corporate becoming a customer. When Techstars ran a program with Disney, Disney partnered with Sphero, a program participant, to create what is now the BB-8 robotic toy. Disney injected the brand and distribution, Sphero contributed the technology and engineering. This toy was one of the world’s most successful toys when it was introduced into the market, generating hundreds of millions of dollars in sales. Another example comes from the METRO Accelerator for Hospitality, Powered by Techstars in Berlin (full disclosure: I have been the managing director here for two years). FragPaul (Ask Paul) is a maker of HR software for German restaurants. METRO signed a rollout deal with FragPaul, and now delivers over 100 qualified leads to the company every single week. This kind of deal flow is life changing when you are a two person startup who didn’t have to raise capital to date, and now employs 10X more staff less than a year later. Another pilot example from Techstars’ METRO Hospitality program is Flowtify, who simplifies HACCP, a systematic approach to food safety for gastronomy operators. METRO tested the product in some of its store restaurants, provided valuable product feedback to the Flowtify team, and helped the company find its sweet spot. The product is now used in a variety of gastronomy establishments and recently won the 2018 Intergastra Innovation Prize. The success of pilots depends on a number of factors. First, you need dedicated staff on the corporate side who work 100 percent of their time on the pilot project and oversee its success. There needs to be a clear pilot process, quantification of what constitutes success, and timelines that delineate what is supposed to happen when. If this is coupled with a functional follow-on path for what is actually happening beyond the pilot, and a dedicated budget, this approach is extremely successful. When this happens at scale, startup partnerships can have a huge impact on the bottom line of corporations. Six startups from the current METRO Hospitality program are in the midst of successfully piloting their technologies with METRO. If the rate of sales continues at where it currently stands, these startups have the potential to be generating $1B in sales with METRO per year. That’s game changing for the startups, and also moves the needle for METRO. I am looking forward to seeing far more of these pilots done right in the future. This week, we welcomed 10 new teams into the METRO Accelerator for Hospitality, Powered by Techstars family. As per usual, the METRO events team found a uniquely fitting venue to cater the occasion. We were hosted in B.HORN, a cool little restaurant bar in Neukölln, an up and coming and exciting part of Berlin. I caught up with Andreas Wuerfel, the CEO of HoReCa Digital Inc to chat about what HoReCa Digital and METRO are doing in the world of startups. Andreas is the guy who is responsible for building the alumni support community around the METRO Accelerator programs. These 10 new Hospitality focused startups are joining the fourth class of the METRO Accelerator and Techstars partnership. We now have two separate programs together with METRO in Berlin. One for retail, which just finished its first class last week and a program for hospitality, which just kicked off. METRO and Techstars have made investments in over 40 companies in the HoReCa (Hotel/Restaurant/Catering) space. For them, it’s “the ability to have conversations early on” with their customers to find out what technologies they need to succeed and to really help build out the next wave of platforms that will manage the world of hotels, restaurants and catering. From Boulder to Dubai, Austin to Boston, NYC to Seattle and Anywhere in between, including Techstars Anywhere, our mostly-virtual accelerator! The team is incredibly proud to introduce the 2017 class of METRO Accelerator for Hospitality, Powered by Techstars. These ten startups are gathering in the heart of Berlin for three months to accelerate, fund and grow their concepts to robust scalable businesses. The highlight of the program: the participants will present their companies to a panel of international investors at the Demo Day in Munich on 12 December 2017. For the third consecutive year, METRO AG and the US startup network Techstars are jointly supporting startups with innovative digital solutions for the hospitality sector – with great success among international investors. In the first rounds, the participating startups generated an above average total volume of over USD 55 million in venture capital. “Since we launched the accelerator program for hospitality in 2015 we have already selected and promoted 21 exciting startups, selected from several hundred applicants. We can with confidence state after the third round that the METRO Accelerator for Hospitality has turned into a fully established program. It is the first program to connect the hospitality industry with first-rate technology innovators. We offer startups the opportunity to test their digital products and services with 500 restaurants and hotels in five European cities”, says Andreas Wuerfel, Director Global Innovation Community at METRO. Today, the third round kicked off in Berlin. Over a period of three months, the participating startup founders will collaborate with more than 100 international mentors to further fine-tune their business models. The real test will be the Demo Day in Munich on 12 December 2017: that is when the start-ups will present their business ideas to international investors. Will restaurant visitors soon be calling the waiter with the help of an illuminated LED cube? Or will we soon have machines mixing cocktails so that the bartenders can focus even more on advising their guests? These are but two examples of what the routine at the restaurant of the future could look like if it were up to the startups who made it into the third class of the METRO Accelerator for Hospitality, Powered by Techstars. …get paid to do it, and then sell it to thousands more. Here is the background to this. Techstars, the Worldwide Network that helps entrepreneurs succeed and METRO, the wholesale giant that supplies over one million restaurants with food, run an accelerator program together. The METRO Accelerator for Hospitality, Powered by Techstars. This is a three-month accelerator program that focuses on tech startups that have restaurants or hotels as customers. This program has one very specific element to it. METRO has a new division, called HoReCa.digital. HoReCa.digital has something they call a digital sales force. That digital sales force markets only digital products to restaurants and hotels. They do this in a two-step process. First, they test the digital product with restaurant or hotel owners who are early adopters when it comes to tech. The owners love playing with new products. This test can be done in one of five countries: Germany, France, Austria, Italy or Spain. During those tests, METRO pays for the product; the customer gets it for free. But in exchange, they have to give honest, structured feedback about the product to METRO and the startup. Second, when the feedback is positive, the sales force can take the product into a countrywide rollout. This means marketing it to thousands and tens of thousands of potential customers. Let’s use an example to illustrate how this can work. In the 2016 METRO Accelerator program, we invested in a startup called Resment that was making HR software for German restaurants. We did tests with potential customers and found out that these needed three features. Of these, Resment had one, the second they had, but it needed to change, and the third needed to be added. Also, restaurant owners really did not like the brand. So Resment changed its name to Ask Paul, iterated on the features and subsequently had very positive resonance with restaurant owners. Ask Paul successfully signed a country-wide rollout deal with METRO, and within three months, the METRO sales force had generated over 2000 qualified leads for Ask Paul. So here is the thing. If you are an early stage startup, how do you access thousands of customers? How do you attract, hire and manage a sales force with seasoned people who know how to market to customers? How do you do this countrywide? How do you ramp this up quickly? How do you ramp this up without spending a lot of money? Below is a picture of Ask Paul CEO Marc with the HoReCa.digital sales team. This is also his sales team (Ask Paul has full-time sales people, too). At the same time, this could also be your sales team, too. One of the ways is to use the digital sales team as a shortcut to help you ramp up your structures and processes, and then to subsequently supplement that team with your own full-time staff. This year, we are expanding this sales capability from one country to five. Germany, France, Austria, Italy and Spain. 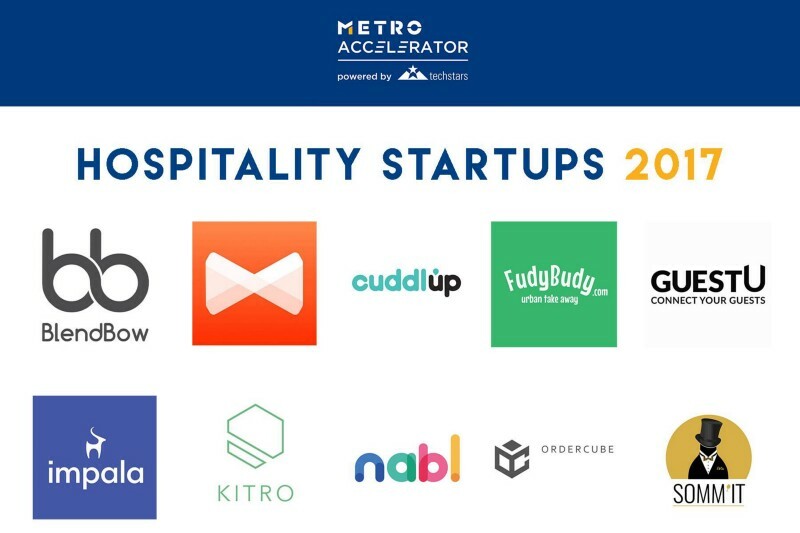 Every startup that goes through the METRO Accelerator for Hospitality, Powered by Techstars program will have the opportunity to test its product in 500 restaurants and hotels, get paid to do it and then to sell it to thousands more. The program may run in Berlin, but the test with customers runs in one of these five countries, and the startups will frequently travel to their target country during the program. Once you are selling in one of these five countries, can you sell in the others? Yes, you can. And thus you can also use the digital sales team to help you with internationalization. If you want to test your product in 500 restaurants and hotels, get paid doing it, then roll it out to thousands and tens of thousands of potential customers, we would love to hear from you.